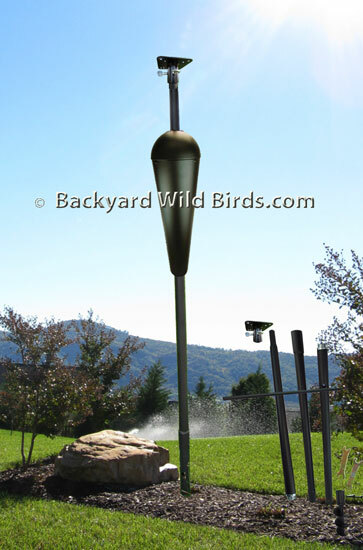 Bird House Pole With Baffle features a sturdy metal, rust resistant design, sure to hold up to even the largest and heaviest birdhouses and birdfeeders. The three pole sections attach easily to one another and include a heavy duty auger and a bird house mounting plate with screws. The Pole Kit is innovative in design, with a 1 1/4 inch diameter at the auger that tapers to a 1 inch diameter top which mates to the mounting plate with turn screws for removal if desired. The overall height is 79.5 inches, and measures about 60" above ground and 20" below ground. Included is a Squirrel Stopper Jr Pole predator Baffle. It is an all metal design that uses spring technology, so the baffle moves up and down and side to side when squirrels or raccoons try to climb it. The inverted cone shroud baffle works is mounted about 4 feet off the ground and 8-10 feet from any trees, walls, or overhangs, anything a squirrel may use to jump from. Absolutely will stop ground attacks from squirrels and bring a smile to your face when they fail. The baffle is 27" long with an 8" diameter tapering down to 4". Must be able to slip over and down the pole to mount. Get yours today and say bye bye to predator problems.